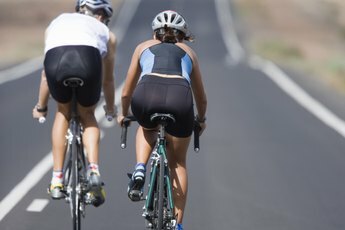 Alternate steady state and interval sessions for best results. Head into any commercial gym at peak time, and you'll likely see a huge queue of people waiting for their turn on the cross trainer. Also known as an ellipitical trainer, it's a pretty popular choice among people when it comes to a cardio workout. A half-hour on the cross trainer burns between 270 and 400 calories, depending on your body weight, according to Harvard Medical School. However, you can make the cross trainer even more effective for weight loss by adjusting your workout intensity and implementing a few simple tweaks. Train for at least 75 minutes a week if you're working at a high intensity, or 150 minutes if you're going at a low to moderate pace. This is the amount of aerobic training needed for health and weight-loss benefits, according to the Centers for Disease Control and Prevention. Split this time into three separate workouts. You might find that trying to do your whole weekly training time in just one or two workouts is too much. By splitting it into shorter sessions, you'll be able to work harder in each and burn more calories in the process. Perform HIIT -- high-intensity interval training -- instead of sticking to a steady pace all the time. HIIT is far superior to steady-state cardio for weight loss and fat-burning, claims strength coach Rachel Cosgrove, co-founder of Results Fitness in California. Warm up for five minutes, and then go as fast as you can for 30 seconds before returning to a steady pace for 90 seconds. Repeat this protocol eight times, and then cool down for five minutes. Aim to add an extra sprint every session. Once you can do 12 sprints, increase the work to rest ratio to 40:80. Alternate an HIIT session with a steady-state one. Reduce your daily caloric intake. You can exercise as much as you like, but if you're consuming too many calories, you won't lose weight. 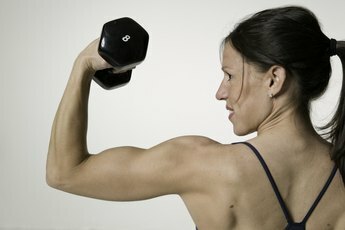 MayoClinic.com recommends cutting 500 calories per day -- this should result in a pound of fat loss each week from diet alone. Cut calories by switching to lean meat and low-fat dairy products, swapping grains for vegetables and reducing your sugar intake. Ask a trainer at the gym to assist you in setting up the cross trainer. The American College of Sports Medicine advise choosing a machine that suits your stride length and that can be adjusted to different levels. Check with your health care provider before starting an exercise and diet regime.